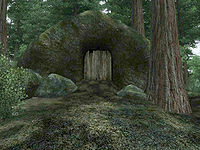 Haynote Cave is a medium-sized cave between the Imperial City and Skingrad containing monsters and animals. It contains three zones: Haynote Cave, Haynote Basin Galleries, and Haynote Winding Sump. This cave contains 17 Cairn Bolete plants and 52 Wisp Stalk plants. 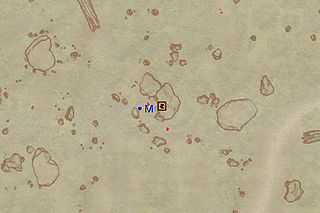 This location's map marker (M on map) is named Haynote Cave (editor name HaynoteCaveMapMarker). The entrance door is E of the marker, 30 feet away. The first room contains two enemies, two minor loot chests and two tunnels heading in opposite directions. Head east and battle your way through another room with two enemies and a minor loot chest. Be ready for the next room as you may have to fight up to three enemies guarding another minor loot chest. In the next corridor, you can either head south or west - choose the former to gain access to another minor loot chest and up to two enemies. The fighting will probably attract the last enemy of this zone, so watch your back. 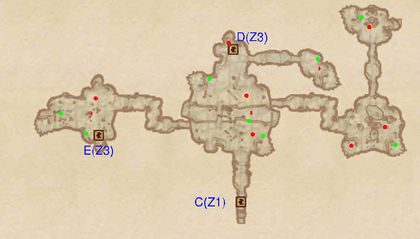 Backtrack slightly, loot the chest in the final room and head to the next zone through door C.
You immediately arrive in a large room with a canyon bisecting it east to west. There is an enemy on your side and two on the other, so try to avoid them ganging up on you. There is also a chance of an enemy below in the canyon, who is likely to detect you, although it won't be able to reach you. Don't miss the half-sunken chest in the northeastern corner of your side of the room. Cross over the narrow stone bridge and loot the chest nearby. In a room to the east lies another minor loot chest, potentially guarded by an enemy. Although you could head straight to the next zone through door D, jump down in the canyon instead and loot the chest nearby. Head east to a room with a rocky outcrop overgrown by wisp stalks and containing two enemies and a minor loot chest. The next room also houses a chest and an enemy. 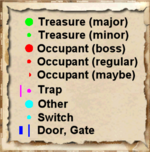 Track back and head west into the final room, where two minor loot chests are guarded by up to two enemies, and take door E to the next zone. Be prepared because you will immediately face up to two enemies guarding two minor loot chests. Head into the next room for another two on one fight and another chest. After dispatching another enemy in the corridor ahead, you will arrive in a large room with a water filled canyon running north to south. There is one enemy on your side and up to two on the other, so try to avoid fighting them all at once. After looting the chest on your side, use the large roots to cross the gap and loot another chest. 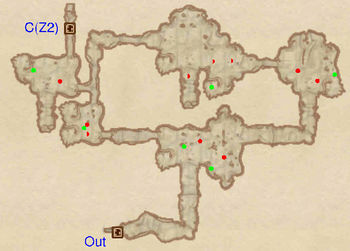 You can either jump into the water below or take the tunnel in the northeastern corner; both lead to the final room. Taking the watery route may involve fighting another enemy and having water breathing capabilities is suggested. Either way, you will arrive in a large room with a lake in the center. Two minor loot chests are in the lake and a third is tucked away in the southwestern corner. Up to three enemies are guarding them. Once you've dealt with them, head back to the second zone through door D.
This page was last modified on 25 March 2018, at 02:55.